Alex Jones has received a secret report distributed by the Missouri Information Analysis Center (MIAC) entitled “The Modern Militia Movement” and dated February 20, 2009. A footer on the document indicates it is “unclassified” but “law enforcement sensitive,” in other words not for public consumption. A copy of the report was sent to Jones by an anonymous Missouri police officer. Click on above thumbnails to see larger images. 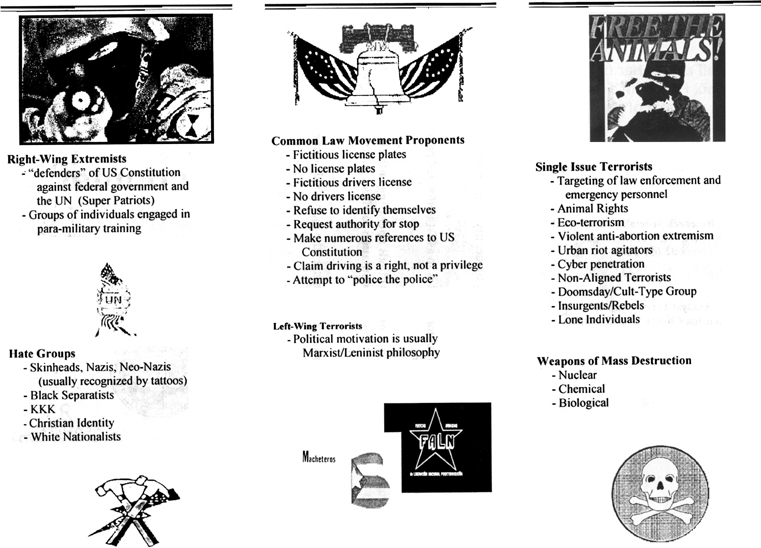 The MIAC report specifically describes supporters of presidential candidates Ron Paul, Chuck Baldwin, and Bob Barr as “militia” influenced terrorists and instructs the Missouri police to be on the lookout for supporters displaying bumper stickers and other paraphernalia associated with the Constitutional, Campaign for Liberty, and Libertarian parties. MIAC is part of the federal “fusion” effort now underway around the country. “As of February 2009, there were 58 fusion centers around the country. The Department has deployed 31 officers as of December 2008 and plans to have 70 professionals deployed by the end of 2009. The Department has provided more than $254 million from FY 2004-2007 to state and local governments to support the centers,” explains the Department of Homeland Security on its website. 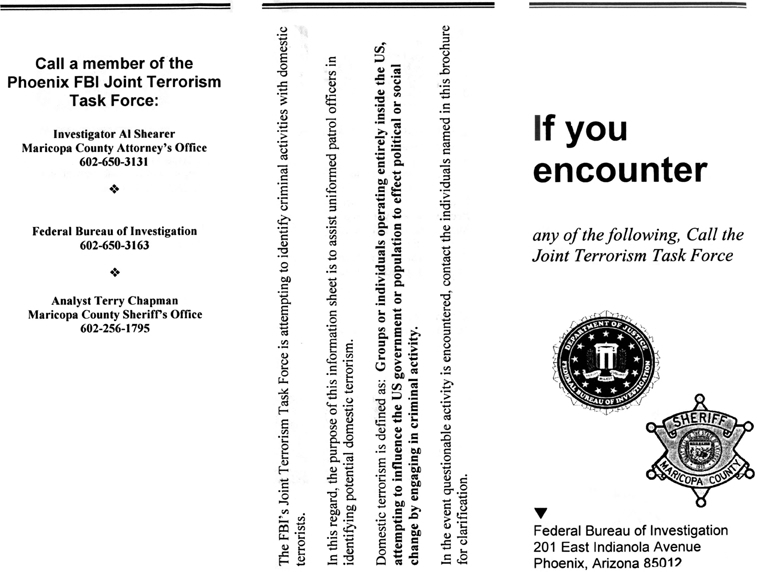 Missouri is mentioned as a participant in this federal “intelligence” effort. The MIAC report does not concentrate on Muslim terrorists, but rather on the so-called “militia movement” and conflates it with supporters of Ron Paul, Chuck Baldwin, Bob Barr, the so-called patriot movement and other political activist organizations opposed to the North American Union and the New World Order. The MIAC document is a classic guilt by association effort designed to demonize legitimate political activity that stands in opposition to the New World Order and its newly enshrined front man, Barack Obama. In September of 2008, Missouri sheriffs and prosecutors organized truth squads to intimidate people opposed to Obama and threatened to arrest and prosecute anybody who ran “misleading television ads.” Missouri governor Matt Blunt eventually denounced the use of “police state tactics” on the part of the Obama-Biden campaign. MIAC claims members of a “rightwing” militia movement organized in the 1990s — generally in response to the Oklahoma City bombing and the events at Waco — “continuously exploit world events in order to increase participation in their movements. Due to the current economical and political situation, a lush environment for militia activity has been created” and supposedly exploited by “constitutionalists” and “white supremacists,” the latter an oft-employed canard used to demonize activists as dangerous and potentially violent lunatics. MIAC notes many of the political issues cited by the so-called patriot movement — the Ammunition Accountability Act, the impending economic collapse of the government, the possibility of a constitutional convention, the North American Union, Obama’s “Universal Service Program,” and the implementation of RFID, issues that are not limited to the patriot movement but are shared by a wide array of political activists. The MIAC document includes a map of the North American Union not dissimilar from one released by NASCO, the North America SuperCorridor Coalition (see the NASCO map here). The MIAC report is similar to one created by the Phoenix Federal Bureau of Investigation and the Joint Terrorism Task Force during the Clinton administration (see page one and page two of the document). The FBI document explicitly designates “defenders” of the Constitution as “right-wing extremists.” The MIAC report expands significantly on the earlier document. The MIAC effort to characterize Libertarians and Constitutionalists as racists is reminiscent of an attempt by the corporate media in early 2008 to portray Ron Paul as a racist by attempting to link him to a series of vaguely racist newsletters produced in the 1980s. Paul did not exercise editorial control over the newsletters and went so far as to apologize for them, but this did not prevent the corporate media from characterizing him as a racist. In regard to supposed militia movement literature and media, the MIAC report mentions Aaron Russo’s America: Freedom to Fascism and William Luther Pierce’s The Turner Diaries — the latter was penned by the former leader of the white nationalist organization National Alliance and the former by a Libertarian filmmaker. In order to underscore the absurdity of the MIAC attempt to link Pierce’s novel and Russo’s anti-tax documentary, it should be noted that the late Aaron Russo was Jewish and The Turner Dairies posits a Zionist government in America (or ZOG, the Zionist Occupation Government) run by Jews. The award-winning film Zeitgeist, featuring Alex Jones, is also mentioned as terrorist material. The MIAC report is particularly pernicious because it indoctrinates Missouri law enforcement in the belief that people who oppose confiscatory taxation, believe in the well-documented existence of a New World Order and world government (a Google search of this phrase will pull up numerous references made by scores of establishment political leaders), and are opposed to the obvious expansion of the federal government at the expense of the states as violent extremists who are gunning for the police. It specifically targets supporters of mainstream political candidates and encourages police officers to consider them dangerous terrorists. MIAC is attempting to radicalize the police against political activity guaranteed by the U.S. Constitution and the Bill of Rights. If Missouri police indoctrinated by MIAC propaganda overreact to political activists and supporters of Ron Paul in their state and injure or kill people involved in entirely legal and legitimate political activity, MIAC, the governor of Missouri (his name appears on the MIAC document), and the DHS and federal government should be held directly responsible and prosecuted the fullest extent of the law.